Great cities don't just happen. They are the result of dedicated citizens and public officials who care about their hometowns and who are wiling to shake things up to make them better places to live, work and play. This almost always involves imaginative innovations, which defy all the conventional wisdom about how to plan cities. Here are five success stories from five continents that can encourage you to initiate some bold moves to turn around things in your own town. Melbourne gloriously revived its sagging downtown by emphasizing public spaces and deemphasizing auto accessibility. Zurich built one of the world's great transit systems by embracing the tram at a time when streetcar tracks were being torn up everywhere else. Bogota, Colombia, got everybody on bikes in a city where almost nobody rode them before. Hong Kong, once notorious as a terrible place for anyone on foot, is making significant steps toward becoming pedestrian friendly. And Indianapolis, whose name is synonymous with speeding cars, is building world-class facilities for bicyclists and pedestrians right through the heart of downtown. 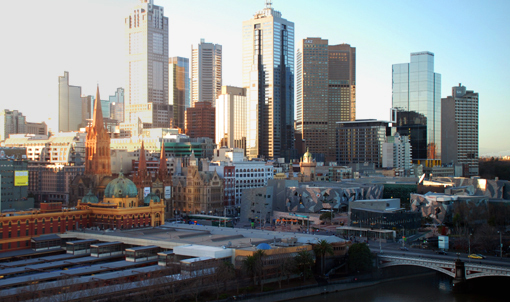 Melbourne's central business district is at least as lively and urban as any U.S. city other than New York. The fastest growing city in Australia with a population of nearly 4 million, Melbourne offers a rich street life and public realm. But that hasn't always been so. Melbourne went as far, maybe further, than its U.S. counterparts in planning itself around the automobile. Gehl’s studies also tracked the steady improvements of ground floor retail spaces in central Melbourne, which contributed significantly to the city's increasing pedestrian friendliness and the revitalization of downtown, as well as validating continued efforts to decrease auto traffic in Melbourne. 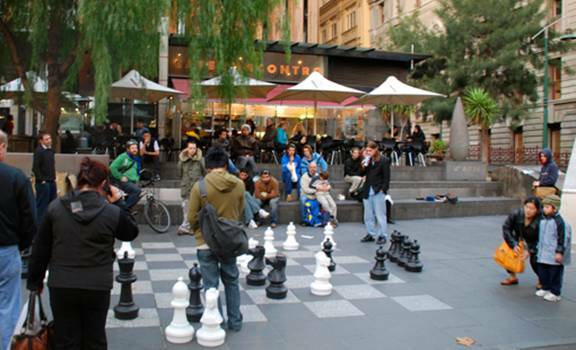 ‍In the middle of one of the busiest sidewalks in Melbourne, people take time to stop and play chess, watch chess or just watch people. In commissioning these studies Adams and other city officials charted a bold course by defining public spaces as a key issue in for improving the city. Ultimately, this attention led to a huge investment in Melbourne’s public spaces, and ultimately an increase in the quality and vitality of the city’s public life. 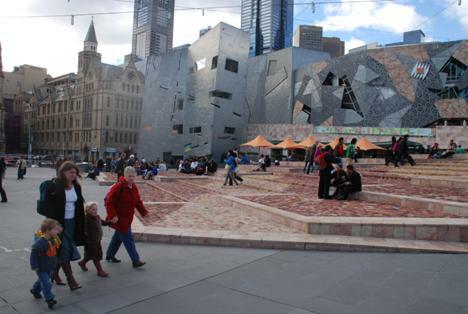 Federation Square, completed in 2002, was the greatest testament to the city's commitment to fostering public life. Built over a rail yard, Federation Square now functions as Melbourne’s living room, cultural center and nighttime destination. It took a large public investment of $473 million Australian (just under $400 Million U.S.) to do the project. Despite initial community resistance, the Square has been embraced by the city and is generating significant returns on many fronts. A destination such as this, despite greater difficulty in accessing via the private automobile, nonetheless brings people downtown and gives them a reason to stay and enjoy themselves. 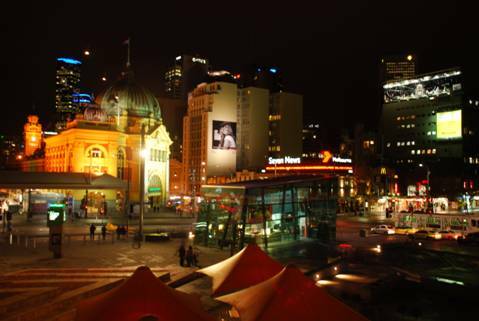 Federation Square, the new heart of downtown Melbourne, is a lively mixed-use space during both day and night. At first glance, one might assume that the successful revitalization of Melbourne's downtown was soley the result of thinning automobile traffic in the central business district. But traffic reduction was only one piece of the puzzle. Melbourne's renaissance was accomplished by focusing on the improvement, democratization and vitality of the city's public spaces. 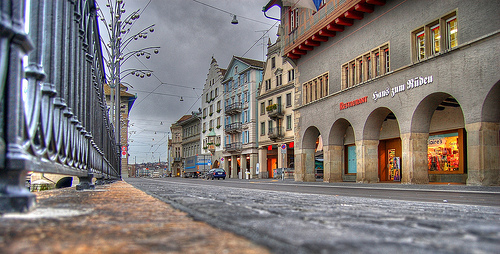 The city of Zurich is famous for its banks and its chocolate. It is also increasingly known for making a dramatic transition from a city reliant on private cars to one committed to public transit. Zurich has one of the highest levels of per capita transit ridership in the world. At 560 trips per year, Zurich’s population makes roughly twice the number of trips per capita than those of Europe’s largest cities, including London, Paris and Berlin. With 76 percent of work and recreation trips made by transit, it overshadows even America’s most transit-friendly city, New York, which boasts only 25 percent of trips by transit. But it wasn’t always this way: Although the city had a tram system in place in the early 1970s, Zurich suffered a problem all too familiar to American cities today. Automobile ownership and congestion were increasing, while jobs and housing were moving out from the city center. The federal government put forth a proposal in 1973 to construct an underground network of trams andg trains, as many other European Cities had done. With the removal of public transit lines on the streets, more available space could be handed over to the car. 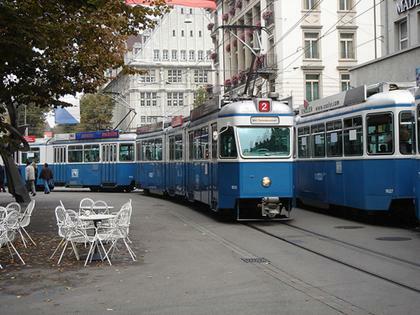 ‍Zurich’s splendid tram system fosters a vibrant public life throughout the city. Public outcry, however, was immediate and unexpected. Although citizens rallied against the motion for a variety of reasons (fear of urban growth and gentrification among them), the result was a resounding defeat at the polls. Soon afterwards a newly formed citizens group, the People’s Initiative for the Promotion of Public Transportation, proposed renovating the ailing tram system—an idea which defied all the conventional wisdom in the urban planning profession at that time. The proposal quickly gained momentum among the auto-weary citizenry but was opposed by politicians, businesses, engineers and other experts. The initiative was placed on the ballot in March 1977, and approved. Zurich’s planners estimated that it required five to ten lanes of car traffic to move the same number of people in one hour (8,000) as it does one tram. The introduction of hundreds of new tram cars to the transit system has allowed the city to save or reclaim valued public spaces that would have been given over to the automobile. Despite its initial opposition, Zurich’s government now makes continual improvements to the transit system because public officials realize how much it contributes to the livability of the city. 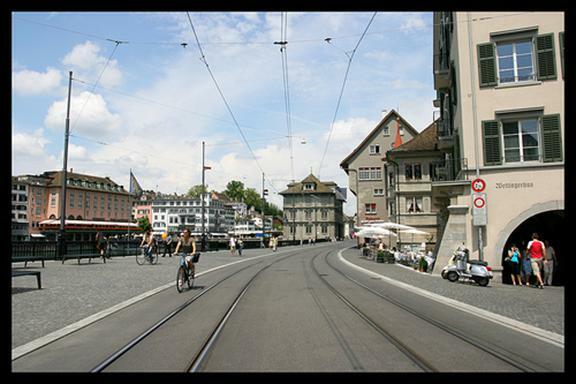 ‍By emphasizing trams over autos in the city streets, Zurich has been able to create more public space for people. Zurich’s bold move in embracing transit speaks to the power of the democratic process. The success of Zurich’s transit priority program bodes well for starting this dialogue between voters and their governments worldwide. "It is like a gigantic park that is open 7 hours a week, and people of all ages and backgrounds take over the otherwise car dominated space and have fun." This is how Guillermo (Gil) Peñalosa, former parks directors, describes Ciclovia, a unique event pioneered in Bogota and now emulated around the world. Each Sunday and holiday in Bogata, people stream into city streets for everything but driving. Since its creation in 1976, Ciclovia (which means bike path in Spanish) has grown from 8 miles of “reclaimed” road space and 140,000 weekly bike riders to 70 miles and an average of 1.5 million weekly riders, a huge turn out in a city of seven million. A key reason for the event’s success is topnotch management, featuring official volunteers in special uniforms, strong marketing and clear signage, along with an abundance of food vendors, and bike repair stands. 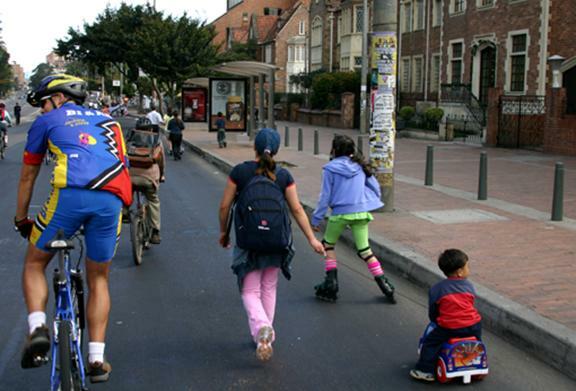 ‍On Sundays, 70 miles of Bogota streets are closed to cars and open to people on foot, bikes, and skates. You will see people in $5,000 bikes and others in $50 bikes, and all having the same fun!” Penalsoa enthuses. “Rich and poor, young and old, men and woman, tall or short... ALL!" The event is also credited with encouraging many people to become daily bike commuters along the extensive network of bicycle lanes the city has developed. 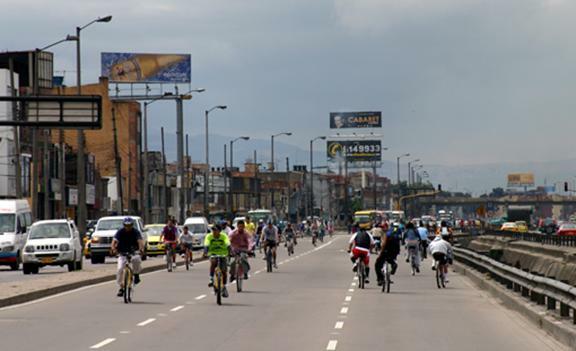 Before Ciclovia, Bogota sported very few bicyclists. Surveys show that 4 million people regularly attend the event, spending on average 4 hours and 15 minutes. Penalosa points out that participants “go to walk or bike, skate or do aerobics and to watch people, a preferred activity by human beings." Penalosa, who now lives in Canada and is a Senior Associate with Project for Public Spaces and director of Walk and Bike for Life, is currently working with leaders in The Bronx, Chicago, Cleveland, Baltimore, and Vancouver to develop similar programs. He helped set up a successful Ciclovia program in Guadalajara, Mexico that began with eight miles and 75,000 participants three years ago, and now covers 14 miles and attracts 140,000 every week. Several other cities in South America, like Quito, Ecuador and Santiago, Chile have also successfully implemented similar programs. ‍This Ciclovia event, allows all ages and social classes to share the streets, which helps address the great class, race and ideological divides in Colombia. 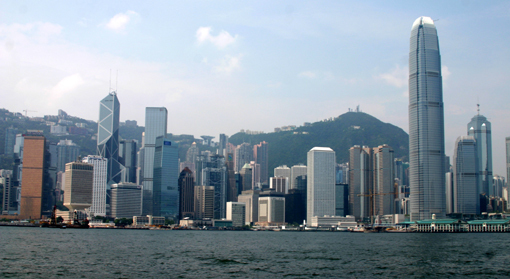 North American cities looking for ways to deal with congestion and its negative impact on the economy should look across the Pacific to Hong Kong. This is a place that still has a long way to go in becoming a great city. Like many North American cities, it faces many serious challenges such as land use issues, public spaces, an underperforming waterfront, overall sustainability, and the dominance that business interests have over planning decisions. The city’s street markets, including the famous Graham Street Market, are under threat from government officials. But in some Hong King neighborhoods, there are impressive initiatives to make its congested streets more pedestrian-friendly. 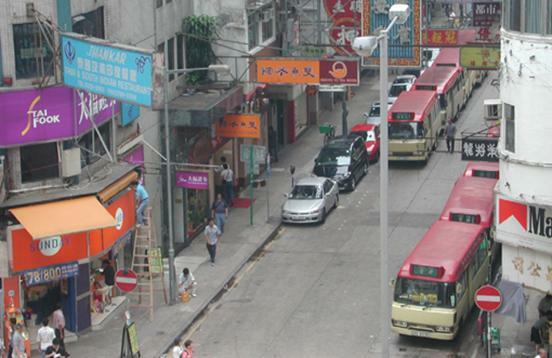 As recently as seven years ago, Hong Kong had virtually no streets that were comfortable for people to walk despite its international reputation as a bustling shopping city. In the intervening years the city is seeing the start of a transformation led by none other than the city's Transport Department. In each of ten central districts, the Transport Department chose to do a combination of traffic calming and closing streets to vehicles—some permanently and some during certain hours. In the Causeway Bay area, for instance, the city has transformed an area of isolated, inward-focused shopping centers into a lively shopping district with a genuinely interesting streetlife. One of the area’s commercial shopping centers is actually named Times Square in an attempt to emulate New York City’s legendary public space, which only strengthens the message that similar improvements could easily be made in New York City itself,, where Times Square and other public spaces struggle with traffic and overcrowding. Hong Kong, a city that once ranked among the world’s worst for walking and where tourists and residents alike dreaded boarding its public transportation system, now offers speedy and efficient mass transit and is beginning to realize the benefits of walkable public spaces. This brave about-face offers inspiration that any city can be turned around with careful attention to pedestrians, transit, and public spaces. 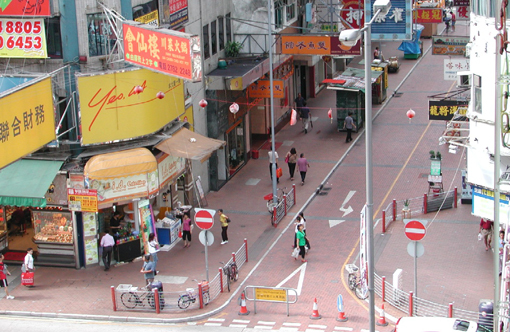 ‍A street in Hong Kong before (above) and after (below) pedestrianization and traffic calming measures were put into effect. Indianapolis, Indiana, is taking what may be the boldest step of any American city towards supporting bicyclists and pedestrians. Known as an extremely auto-oriented city, famous for the Indianapolis 500, it is one of the last places you’d expect to see vehicle lanes being replaced with more space for bicycles and pedestrians. ‍Construction is underway on what may be the nation's most advanced urban greenway system. 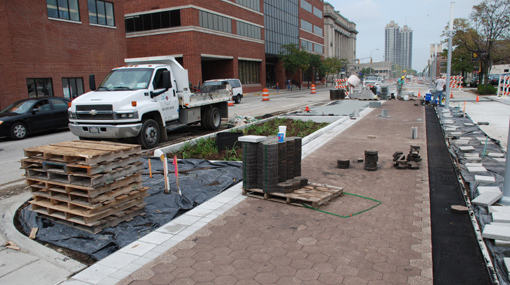 The Indianapolis Cultural Trail, 8 miles of separated greenway, is currently being built through the downtown core of Indianapolis. Led by the Central Indiana Community Foundation in partnership with the city, the project is a bold response to skyrocketing obesity and an opportunity to improve the downtown area. 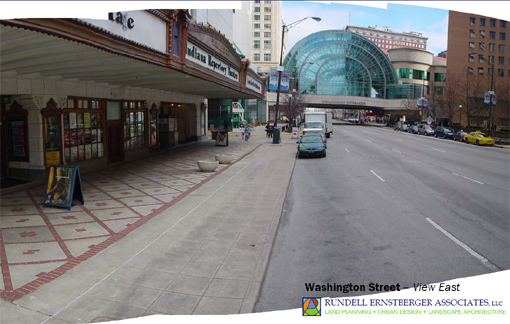 Downtown Indianapolis before the Cultural Trail (Before). 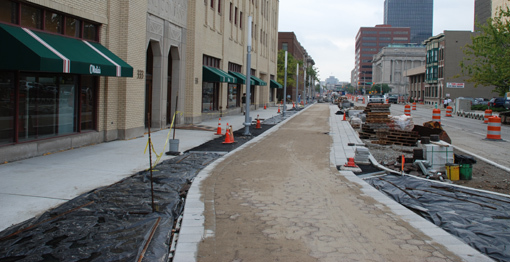 Downtown Indianapolis before the Cultural Trail (After). 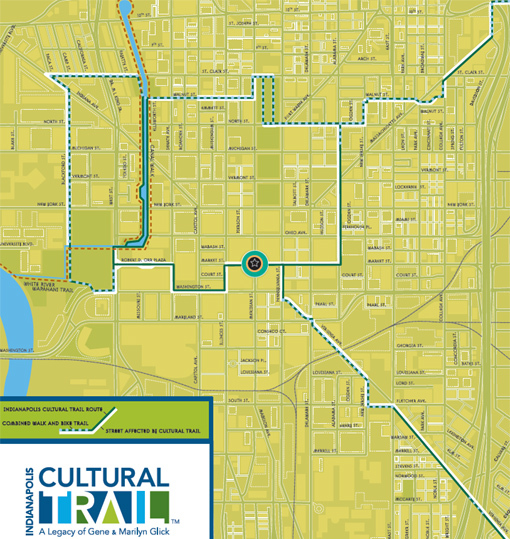 More than just a separated bike path, the Cultural Trail is an economic development tool that will help support and connect the city's many cultural and civic destinations. It will help revitalize the inner city by bringing more people downtown and increasing the length of time that people spend in the central city. It will also enhance street life at existing destinations and help foster new public spaces throughout the downtown. A combination of private and federal funds is being used to pay for the project. Public spaces have generally not attracted this kind of private investment, particularly in car-dominated heartland cities, but a bold vision and strong leadership at a community foundation has now raised the bar for other cities. The Trail will connect and define several districts within the downtown core. ‍The design of the path will give pedestrians and bicyclists a sense of safety and comfort. Project for Public Spaces has done Placemaking training for the grantees and partners of the community foundation's Inspiring Places Initiative. PPS was also involved in the design team for the Cultural Trail project, doing the international best practices research of separated bike paths that influenced the final design. 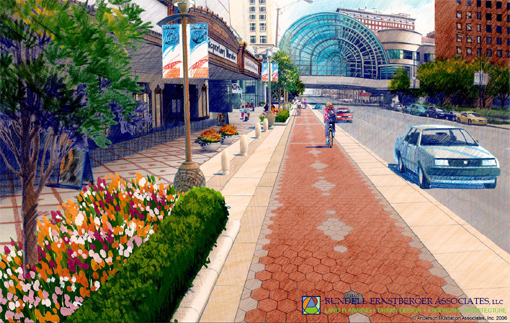 ‍Sidewalk extensions make pedestrians and bicyclists more prominent on car-dominated streets. 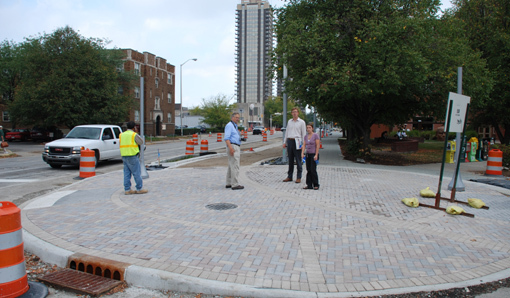 The Cultural Trail is creating a powerful impetus for Indianapolis neighborhood groups to begin redefining their streets as public spaces that can satisfy a broad range of community needs. Indianapolis -- a quintessential Midwestern car town -- has decided that a street can and should be more than just a place to drive and store motor vehicles.